After the March 9 governorship elections across the country, the polls in six states – Adamawa, Bauchi, Benue, Kano, Plateau and Sokoto – were declared inconclusive. In this analysis, The Nation's deputy political editor, Raymond Mordi who has been monitoring the situation writes on how the elections in five states will be fought and won. In Adamawa, the governorship rerun is on hold following a court order; the supplementary poll holds today only in two constituencies for state assembly. The two major parties, the All Progressives Congress (APC) and the Peoples Democratic Party (PDP) resorted to a war of words when the Independent National Electoral Commission (INEC) declared the recent governorship elections in six states inconclusive and announced later that it would conduct supplementary polls in five of the affected states today. The governorship rerun will not hold today in Adamawa because of a court order barring INEC. It will, however, hold in two constituencies for the state assembly. Both conventional and social media are awash with last ditch efforts by the affected parties to get an upper hand in today’s supplementary elections. The two parties have been busy with fresh campaigns, establishing alliances and heading to the courts, to secure injunctions to stop the election. 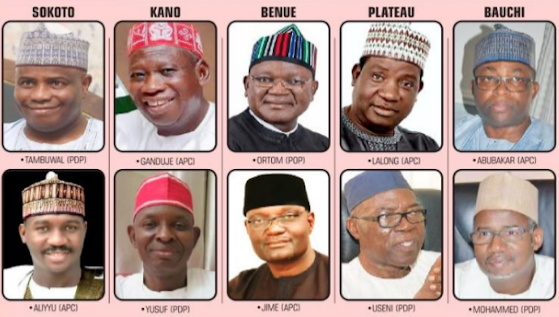 Curiously, it is first-term governors from either the APC or the PDP that are facing serious challenge in the states where elections are scheduled to hold. The following is how the supplementary election battle in each of the states would be fought and won. The back and forth movement over today’s supplementary election in some polling units Bauchi State was eventually settled on Thursday, with INEC saying it will go ahead with the exercise. The Bauchi State governorship election was declared inconclusive, follow ing irregularities in some polling units across 15 local government areas. The INEC Resident Electoral Commissioner (REC) in Bauchi, Ibrahim Abdullahi, said today’s supplementary elections are due to be held in 36 polling units in 15 local government areas. There are 22,759 registered voters in the affected 36 polling units where the supplementary elections will be taking place today. In the results released so far, the PDP candidate, Bala Mohammed, is leading with 4,059 votes; having scored 469,512 votes, against 465,453 votes polled by the incumbent Governor Mohammed Abubakar of the APC. Results from Tafawa Balewa local government are also in dispute, after thugs attacked the local government collation centre and disrupted the collation of results. INEC had decided to resume the collation of results in the council, but a court ruling has suspended the exercise in the local government, which is regarded as a stronghold of the PDP. So, the local government is not part of today’s supplementary elections. INEC had indicated that it would resume the collation of results of the disputed Tafawa Balewa Local Government after considering a report submitted by the Resident Electoral Commissioner (REC) in Bauchi. But it had to stay action on the matter, following the court injunction. The PDP insists that the initial cancellation of the result from the local government was illegal because the returning officer did not have the power to cancel the results already collated. The party said since there were no reports of violent clashes and disruptions of voting at the polling units, which was the only ground for the cancellation of results, the returning officer acted outside his power by rejecting the result from the council. The PDP on Thursday threatened to boycott today’s supplementary elections on the grounds that INEC has allegedly compromised the process by acceding to the demands of the ruling APC. It had also appointed a new collation/returning officer to conclude the collation process, after Mrs Dominion Anosike withdrew over alleged threats to her life and her family. But the decision of the electoral body was rejected by the APC. PDP chairman, Hamza Akuyam, said no supplementary elections should take place until the full governorship election results collation, which ended with Tafawa Balewa local government, are announced. He said: “Doing otherwise will be synonymous with writing a reseat examination while the main examination has not been marked.” He accused the REC in Bauchi of deliberately keeping everybody waiting at the collation centre until around 2pm when he abruptly surfaced with a court injunction halting the collation exercise. With the current state of affairs, the PDP is in pole position to win the election. Apart from the fact that it is leading with 4,059 votes, the results from Tafawa Balewa Local Government, which is a stronghold of the party is still outstanding. At the end of the day, the opposition party is likely to carry the day. In Benue State, with the margin between Governor Samuel Ortom of the PDP and his APC counterpart, Emmanuel Jime, INEC is conducting today’s election to fulfill all righteousness, because it is obvious that PDP has an unassailable lead. The supplementary election will be conducted in almost all the 23 local government areas with about 121,091 votes at stake. After the March 9 election, the PDP was leading 81,554 votes. The party polled 420,576 votes, while its closest challenger, the APC, scored 329,022. INEC had to declare the election inconclusive, because cancelled votes -121,091 — were higher than the margin between the two top candidates. Governor Ortom is likely to emerge victorious at the end of today’s exercise, because it will be difficult to have a 100 per cent turnout and the APC getting enough votes to cancel the PDP’s lead. The two leading political parties have been wooing voters ahead of today’s election. The PDP had insisted that Ortom won the election and that he should be declared winner of the election. Today’s supplementary election in Kano State is a battle between former Governor Rabiu Kwankwaso and incumbent Governor Abdullahi Ganduje. The election is likely to determine the political future of the two gladiators. The two politicians were allies from 1999 when they were elected as governor and deputy governor respectively, up to 2015 when the former nominated the latter to succeed him as the state governor. But, less than two years after the election that brought Ganduje to power, his relationship with his former boss became sour and this finally led to the defection of Kwankwaso to the PDP. Ganduje is seeking re-election to complete a second tenure as governor, while the ‘PDP candidate, Abba Kabir Yusuf, is contesting governorship for the first time. This is where the real contest is. Although the PDP occupies the high ground in this contest, its lead is not enough to guarantee that it would triumph at the end of the day. The final outcome would be determined by the electors who will come out to cast their ballot today. In the results declared so far, the PDP flag bearer leads the incumbent governor with 26,000 votes, while the votes at stake in the 172 polling units where the supplementary election is taking place are 128,572. The March 9 governorship election was cancelled in the affected units due to disturbances over voting and nonusage of the Card Reader machines. The declaration of the election as inconclusive is in accordance with section 26 of the INEC Act, because the number of cancelled votes is beyond the margin between the candidate with the highest votes and the one that came second. In the results released so far, the PDP candidate scored 1,014,474, while the APC had 987,819 votes. There is no telling who will emerge victorious at the end of the day, given the number of registered voters in the area where results were cancelled. Nevertheless, the PDP candidate appears to have an upper hand, with the 26,000 votes advantage he enjoys going into today’s supplementary election. In the case of Plateau State, today’s supplementary election may turn out to be a mere formality. Incumbent Governor Simon Lalong, who is the APC candidate, is in pole position to secure his re-election. While the supplementary elections in Adamawa, Bauchi and Benue seem set to go PDP way, the APC has similarly secured acomfortable lead in Plateau State. Other things being equal, the incumbent, Simon Lalong, seems ready to clinch a second term in office. So far, in the declared election result, Lalong polled 583,255 votes, while Jeremiah Useni of the PDP secured 538,326 votes. With a margin 44,929 between the two contestants and 49,377 cancelled votes, today’s election is a mere formality. Observers say the supplementary election is needless and a mere waste of time and resources because it will be extremely difficult, if not impossible, for Useni to come from far behind to level up the margin and beat Lalong. They say the odds weigh heavily to the point of impossibility against the PDP candidate, for him to defeat the APC candidate. In Sokoto, the PDP candidate, Alhaji Aminu Waziri Tambuwal, is clinging to a narrow lead ahead of his APC counterpart, Alhaji Ahmad Aliyu Sokoto. Tambuwal leads with 3,413 votes, having scored 489,558 votes, against his APC counterparts 486,090 votes. A winner could not be declared since the cancelled votes were more than the margin between the winner and the runner off. The number of registered voters in the area where results were cancelled are 75, 403, whereas Tambuwal is leading his APC counterpart with 3, 413 votes. Sokoto is another electoral contest that is too close to call. After defecting to the PDP to pursue his presidential ambition, Tambuwal lost some of his local support, especially that of the defacto godfather of Sokoto politics and a former governor of the state, Aliyu Wamakko. The APC draws most of its support from the influential Wamakko and many analysts did not give the PDP a chance until it managed to secure a respectable portion of the votes during the presidential election. The supplementary election may, however, offer the APC an opportunity to rouse itself from slumber and restrategise for a better outing.